One of Florida’s most beloved marine mammals has been making a steady comeback over recent years. The West Indian manatee, a species that has been on the U.S. Fish & Wildlife Service “endangered” species list since 1972, has steadily seen its numbers improve over the last 23 years. According to CNN, when aerial surveys began in 1991, there were only 1,267 manatees in Florida waters. 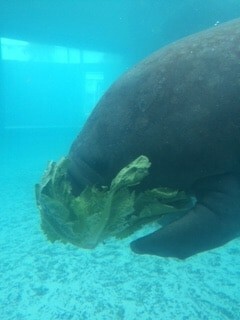 A rescued manatee, Hugh, at Mote Marine Aquarium. Manatees, which are known to inhabit warm, coastal waters all along the cost of Florida and inland estuaries. These large mammals are often referred to as sea cows and rely on a diet of sea grasses, marine algae, water celery, and other types of aquatic vegetation. These slow moving sea cows can grow to nearly ten feet long and weigh up to 1,200 pounds. Their size and unconcerned movements in their natural habitat is one reason that manatees were placed on the endangered species list those many years ago. Their population suffered greatly over decades of crowded, unregulated waterways. Often the victim of boat propellers, manatee numbers suffered due to collisions with fast moving watercraft across the thousands of Florida waterways. Further impact studies showed the coastal construction destroyed much of the manatees natural habitat, further contributing to a decline in population numbers. While the manatee remains protected under the Marine Mammal Protection Act, it may be reclassified as a”threatened” species as early as 2017. However, federal protections, like reduced boat speeds and habitat protection would remain in place despite an improvement in the species population status. Today, manatee numbers in Florida have improved dramatically since the early 90s. There are now an estimated 6,300 manatees in Florida waters – an improvement of nearly 500%. If you want to see these magnificent animals in the wild, visit the Big Bend Power Station in Apollo Beach or take a drive up to Crystal River. These are the easiest places to view manatees in their natural habitat. Manatees are an important member to the Florida ecosystem and an animal that we hope to enjoy for many years to come.